These are split-shipped, so it may be the end of this week before the factory get them all shipped to us. 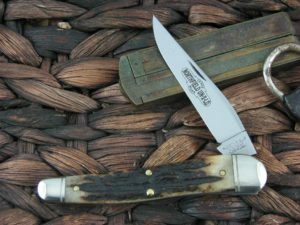 This is the Great Eastern Cutlery Northfield Oregon Trapper Hunter, has Orange Camel Bone handles and Brass liners. The blade steel is 1095 and finish is Polished. 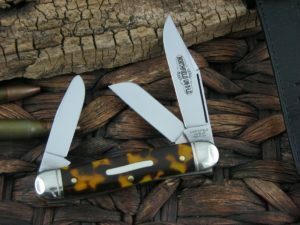 I have a number of GEC’s traditional folders. This one is destined to become one of my favorites. I like the size and the blade shape. The covers look great and are very smooth. The action is just right for me. Not too tight, but certainly not sloppy. I like a lanyard hole on this size knife. It’s big enough to handle a lanyard without being in the way. This knife is one of the best made GEC’s I have acquired in a while. Go for it, if you can get one. 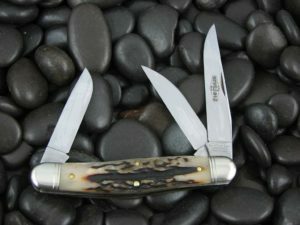 Orange Camel Bone has been one of my favorite covers by GEC. Nice contrast between the bone and bolsters/shield. It’s also nice when there is a lanyard hole and a half stop – interesting that this was a few dollars less than a #74 Stallion in the same covers that had neither. Spring action on this is just right for me – not too stiff or too soft. Everything else – bolster grooves, lanyard fitting, etc – are smooth and fit well. 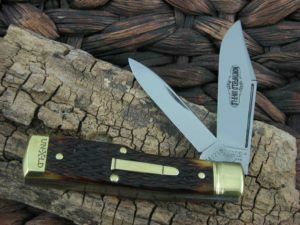 Only thing that I would appreciate is a stainless steel as this looks to be a good outdoor knife.